Scandinavian design is known for being sleek, clean and green and Norway’s capital epitomises just that. Although it has a history dating back a thousand years, it is the modern architecture, the 21st century town planning and the surrounding nature that make it oh so perfect for today’s world. The city sits on the Oslo Fjord presenting a waterfront skyline from nearly every angle. In the summer people picnic on the greens and dive into the clear waters for a dip. In winter, locals don their skis and make the most of what nature has to offer. The surrounding hills and forests (from where most of the world’s most famous Christmas trees are cut from), keeps the city feeling warm and cosy, whatever the season. The city has been built for getting around au natural. No, not naked but on foot or by bike, or for the more adventurous kayaking and hiking are popular modes of transport. 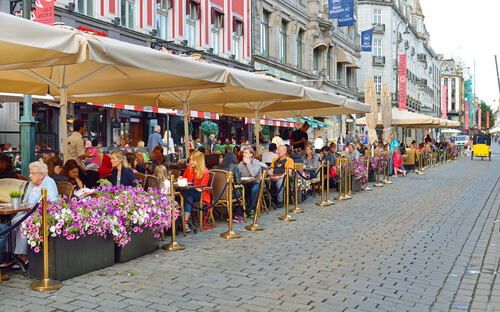 Rather than roads, jammed with traffic, the city centre is full of pedestrian streets, open squares and cycle paths. Not only does it reduce pollution and creates a healthier city but it creates a more human city where people want to spend time. And spend time in it they do. Coffee culture is booming, with cosy corner cafes with open fires or street side, Parisian style cafes, depending on the weather. We love Fuglen, a coffee house in a design store that turns into a bar in the evening. What more could you ask for! Dining in Oslo is an absolute treat. Whether it is getting down and dirty on some King Crab at Mathallen food hall or tucking into the exquisite modern Nordic cuisine served at Sentralen, you’re spoilt for choice. Don’t forget that Oslo is the home of the Viking. So pop in to the Viking Ship Museum to see how they crossed the seas to plunder and pillage around Europe. When you’ve had your fill of plundering then try the Munch Museum that shows many works from bohemian artist, including the iconic ‘The Scream’ that was painted on the shores of a Fjord overlooking Oslo. Contemporary art is also on offer. Work by art stars including Jeff Koons and Damian Hurst is found at the excellent Astrup Fearnley art museum and there are an incredible array of galleries along the central new areas. Although there is plenty of older architecture to keep any history buff entertained it is the contemporary architecture that keeps Oslo at the top of many of the world’s coolest city lists. 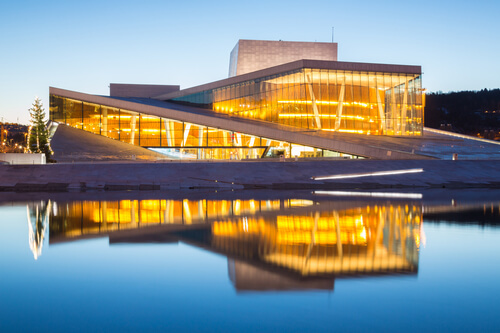 Most recognisable of the city’s modern architectural marvels is the Oslo Opera House. Made of glass and marble it allows people to walk in it, but also under it and over it. Visitors can peek down from a raised walkway, through the glass, to watch musician rehearse – like catching a glimpse of the secret inner workings of music itself. Look out for the wooden plank wall. Not only have new buildings popped up but entire neighbourhoods have too. Vulkan, a former industrial centre is a sustainable masterpiece. 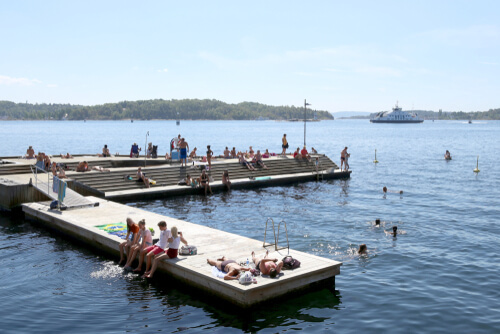 The exclusive area of Tjuvholmen, is the place to come for fine art and architecture spotting. Just around the Fjord is Sørenga, - pop in the fjord for a quick dip followed by a nice relaxing meal in one of the excellent restaurants. And making up much of the new city skyline is Barcode – so called because the tall black and white buildings look like its name sake from a distance.